Proper training is the key to have a well-rounded dog that's happy and safe. Many new dog owners make the mistake of not establishing a strict training regime right off the bat. Unfortunately, this often leads to behavioral problems in the future. While some bad behavior is to be expected from young rambunctious puppies, it can prove to be very dangerous once dogs get a bit older. One tried and true training tool is the dog whistle. Whistles have been around since the 1800s. Even before that, humans have been whistling at their dogs as an effective form of communication. Using a whistle is not for everyone. Like with traditional verbal training, you have to vigilant in your routine and maintain your dog's skills throughout their like. Whistle training is not as simple as most people think. You can't just blow the whistle and expect your dog to respond. It has nothing to do with instincts. Your canine companion has to learn to recognize the tone produced by the whistle and what to do when they hear it. Training your dog to listen to you isn't always an easy task. Many owners experience some type of success during their pup's early years. However, constant exposure to outside stimuli makes it very easy for your dog's training to get muddled. Whistle training offers many benefits that traditional verbal commands just don't have alone. These advantages make it a great option for new and seasoned dog owners alike. Dog whistles first became popular on farms. Shephards used them to command their herding dogs from great distances. The human voice only carries so far. If your dog is several yards away, they may not be able to hear you calling to them. Whistles, on the other hand, can be heard from over 200 yards away. This can prove to be incredibly useful if you're trying to train a working dog or if you own a large piece of property. Even in suburban living, a dog whistle can help you capture your dog's attention if they ever get loose and decide to take a joy run. The high-pitched tone of the whistle cuts through pretty much any type of noise. 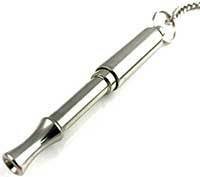 These whistles are in a frequency that your dog can hear clearly. It's not a sound that they typically hear at home or around your neighborhood during daily walks. As a result, it stands out immediately. It can capture your dog's attention, breaking them away from any distractions and putting all the focus on you. This is especially useful if you're at the dog park surrounded by other people spouting off verbal commands. Consistency is important for successful training. It's not enough to simply use the same verbal command or hand gesture to teach your dog. While this may work in the early stages, the same old command can start to get confusing for your dog pretty quickly. Think about the word "sit" and the last time you used it to communicate with your pup. Did you have the same tone and inflection every single time? Chances are, you didn't. This can cause some confusion, especially if your emotions are affecting the way you say it. Dog whistles sound the same, no matter how you blow into them. They produce the same tone when you're mad, sad, or impatient. This consistency eliminates the confusion and lets your dog know what they need to do each time. Another thing you need to consider is how often your dog hears verbal commands. While you may tell your dog to "sit" and "stay" as part of their training, they probably hear the word quite a bit throughout the day, even if it wasn't directed towards them. Eventually, this can make dogs feel like your commands are optional, leading to some behavioral problems. 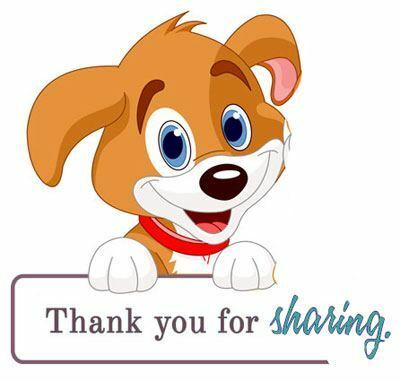 Do you have other family members that share the responsibilities of caring for your pup? If so, whistle training can help to ensure that your dog responds to each command, regardless of who is giving it. As long as you and every person in your family utilize the same whistle commands and training techniques, your pup shouldn't have a problem staying consistent. Many dog owners are guilty of letting their training techniques slide over the years. It's pretty easy to give in to puppy dog eyes and let things slip every now and again. Unfortunately, poor training and maintenance can teach your dog some awful habits. It's not uncommon for dogs to start ignoring commands, especially if they know that there are no ramifications. We've all heard the saying, "You can't teach an old dog new tricks." However, this couldn't be further from the truth. Dog whistle training allows you to start over with a clean slate. The tone of a whistle is drastically different than that of a human voice, so your dog will be able to pick up training cues without any issue. With a whistle, you don't have to worry about the effects of old verbal cues. The great thing about dog whistles is that it's something completely new to dogs that haven't been around them. This means that you can start the training process at any time, even if your dog is already familiar with voice commands. Well-trained dogs will pick up the commands easier, as it's not difficult to transfer verbal commands to whistle commands. If you're looking to restart the training process with an older dog that has started ignoring your commands, it will feel a lot like you're training a puppy. Of course, it's always best to start training as early as possible. You can begin introducing the dog whistle to your puppy early on. Before you start any type of training regime, you're going to need a great whistle! Dog whistles come in all shapes, sizes, and frequencies. You need to choose a whistle that you can stick to throughout your pup's life. Here are some things to consider. The frequency range refers to the pitch the whistle produces. You can get whistles in a wide range of frequencies. It doesn't really matter what frequency you go with. However, once you choose a frequency, you need to stick with it. If you ever need to replace your whistle, you have to get a new one with the exact same frequency. Otherwise, your dog may not respond to the new whistle. Keep the frequency range in mind and write it down somewhere safe so that you always know what it is. Typically, a high-quality whistle is made out of metal. Though, wood and plastic varieties do exist. You're going to want to get a whistle that's tough. The tool will be used around your home and every time you take your pup out. There will be times when you drop it, so make sure that it can hold up to some wear and tear. Also, make sure that it's easy to clean and maintain. Contrary to popular belief, you don't have to get a whistle that's "silent." Yes, it's true that dogs have the ability to hear much higher frequencies than we can. However, you don't have to get a super high-pitched whistle to effectively train your dog. In fact, it's recommended to get something that you can hear. How are you going to make sure that your commands are consistent if you're not even able to hear the sound the whistle is producing? Once you get your dog whistle, you're going to have to figure out what types of commands you want to use. While most people utilize simple words for verbal commands, dog whistles offer a lot of flexibility. You can come up with your own patterns that are simple and easy to remember. There are also some established patterns used by shepherds and dog trainers if you want to give those a try. Before you do anything, you should try your whistle out and get comfortable using it. Dog whistles are a lot like wind instruments in how they're used. To create a strong and consistent command, you need to use your tongue to abruptly stop the air. Give this a try by blowing fast air through the whistle. Then, simply use the tip of your tongue to tap the mouthpiece. It should feel like you're saying "Ta" or making the "T" noise. Your tongue will move the same way. Two of the most basic and fundamental commands your dog needs to learn is "Sit" and "Come". Sitting is not just a party trick. It can be a convenient way to control your dog's behavior in a variety of situations. When your dog sits, they're also stopping whatever they're doing and listening to you. 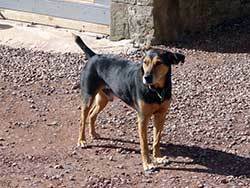 A common dog whistle command for Sit" is one short blast of the whistle. It's quick, attention-grabbing, and very easy for your dog to pick up. Chances are, this command is the one you'll use the most, so it's best to keep it as simple as possible. The "Come" command is just as important as "Sit." It will be used to tell your dog to return to you. Recall training is crucial for keeping your pup contained and safe. Typically, trainers will use a longer recall command. This ensures that your dog can hear it, even if they're a hundred yards away. You can do something like three short blasts of the whistle. These are just two commands you can teach your dog. There are plenty of other things to teach your pup as well. You can teach them to lay down, shake hands, roll over, and more. If you're training a working dog, you can also introduce complex commands that tell them to do specific tasks. Whatever the case may be, you just need to create a distinct whistle pattern. Getting your dog to listen to your whistle commands requires patience and plenty of treats. As with any other type of training, you'll need to reward your dog for the things they do right. This helps to associate the behavior with positive thoughts and feelings. Keep things positive and never yell at your dog. Doing so will only make the process harder. There are multiple ways to get your dog to start listening. The methods that will be right for your pup largely depends on the things they already know. For example, if your pooch already responds pretty well to voice commands, you can simply incorporate the whistle patterns after you give the command to create a connection. This is the easiest method. In fact, many dog owners choose to incorporate verbal cues alongside whistle training anyways to add another layer of communication. If your dog is completely new to training, or you're wiping the slate clean to get rid of bad training, you're going to have to work a bit harder to ensure that your pup understands what you want them to do. To begin the training process for recalls, take your dog into a distraction-free room with plenty of treats in hand. Let your dog do their own thing in the room for a few minutes. Then, use the whistle to give your command. When your dog goes over to you to see what the noise is all about, give them a treat and some loving. You should not beg the dog to come over to you. Have them do so on their own. Repeat this process several times in one training session. Eventually, your dog will start associating that whistle command with the treat. Once you're comfortable, you can move onto a confined area outside. Utilize the same training techniques, treats and all. Teaching your dog to sit is a bit trickier. With this command, you need to give your dog the whistle cue after they sit, not before. To get your dog to sit down, hold a treat above their head. Dogs can only look up so much when they're standing. To get a better view of the treat, they will sit down. When they sit down, use the whistle to give your command and let them have the treat. Before you know it, your dog will sit every time you give the command. Just make sure to provide them with some treats every now and again to ensure that they never forget their training. A dog whistle can help keep your dog's behavior in check. Whistle training is an excellent option for dogs young and old. It's important to remember that the whistle itself will not do the training for you. As an owner, you need to adopt the proper techniques and habits to help your dog reach his or her full potential. Also Read: Why Does Your Dog Like to Sleep on Your Feet?